When the dinosaurs first appeared on earth some 230 million years ago, the ancestors of modern-day lungfishes had already been paddling around for 150 million years. And when the great extinction that took out Tyrannosaurus rex and Company, 66 million years ago, the lungfishes swam right through the global upheaval. 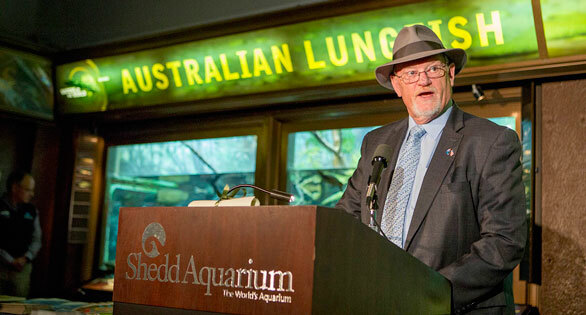 “You can’t kill them,” says one aquarist who keeps lungfishes, and, indeed, the world’s oldest-living aquarium fish recently was toasted for having delighted visitors to Chicago’s Shedd Aquarium for the last 80 years. Affectionately known as “Granddad,” this curiously fossil-like creature is an Australian Lungfish,Neoceratodus forsteri. 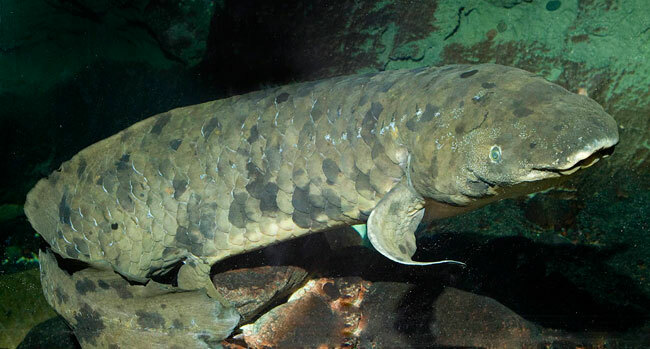 His keepers at Shedd say they have no idea how old this venerable fish was when he arrived, and members of his species are reported to have lived a full century, reaching 1.5 meters in length and more than 40 kg (5 feet long and almost 90 pounds in weight). With obvious physical similarities, lungfishes are related to the ancient-looking coelacanths, also often described as living fossils. Both are classified as sacopterygians, or lobe-finned fishes. 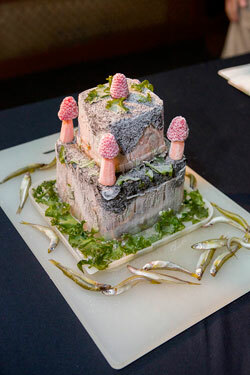 Granddad’s comments are unavailable, but in the wild lungfish are primarily carnivores, feeding on small fishes, tadpoles, frogs, worms, snails, and shrimp, along with some plant material. Australian Lungfish are typically found in quiet pools in slow-moving waters in southeastern Queensland. Although not considered endangered, they are a protected species and may not be caught without a special permit. Jindalee International Pty Limited, in Brisbane, doing business as Ceratodus.com, is CITES-approved and licensed to breed, sell and export lungfish from Australia. To qualify for CITES approval, each fish must be DNA tested and tagged with an implanted microchip. Exports must be approved by the Australian Department of Environment and Heritage.